The mission was a failure. Even though Zivah and Dineas discovered a secret that could bring down the empire, their information is useless without proof. Now, with their cover blown and their quest abandoned, their only remaining hope is to get home before Ampara brings the full might of its armies against their peoples. As Shidadi and Dara alike prepare for war, Zivah and Dineas grapple with the toll of their time in the capital. After fighting alongside the Amparans against his own kin, can Dineas convince the Shidadi-and himself-where his loyalties lie? After betraying her healer's vows in Sehmar City, can Zivah find a way to redeem herself-especially when the Dara ask her to do the unthinkable? And after reluctantly falling in love, what will the two do with their lingering feelings, now that the Dineas from Sehmar City is gone forever? Time is running out for all of them, but especially Zivah whose plague symptoms surface once again. Now, she must decide how she'll define the life she has left. Together, healer and warrior must find the courage to save their people, expose the truth, and face the devastating consequences headed their way. I love everything about this duology. 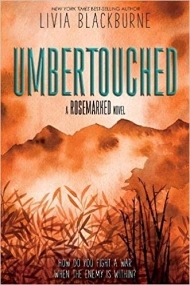 UMBERTOUCHED is the end to the Rosemarked Duology and I'm blown away by it. When Zivah and Dineas are discovered to be spies, their only choice is to flee back home. However, it's harder than they expect, especially since Dineas is plagued by nightmares and memories of time spent as an Amparan soldier. He's almost split in two, an inner battle that struggles to clear the path for what's right in the war. Shidadi or Amparan? Not to mention that his Shidadi comrades are suspicious of him being a traitor. Zivah has her mind set on doing what's right when it comes to the vow she took as a healer. However, the Shidadi leaders want to take out the Amparan numbers the same way Kiran does: wielding the rose plague like a weapon. Zivah is the only one with talent enough to pull it off, but she won't be a part of something that's against everything she stands for. Instead, she needs answers and there's only one healer who has it. Things are strange between Zivah and Dineas through this whole story because Zivah feels guilty for the side effects the potions had on Dineas. He feels like he let her down by not being the happy person he was in Amparan. Both of them are scarred from the things they've seen and done, but nothing can break the bond that's been forming between them. I absolutely love everything about this book. Not one complaint. The twists and turns it took had me on an exciting ride and I didn't want it to stop! I look forward to more books from Livia Blackburne. I love the ending! Final Verdict: I would recommend this to fans of fantasy, romance, action, war, politics, proving yourself, and stories with strong heroines who are strong even though their days are numbered.